We’ve got the ultimate stuffing line-up for you today. 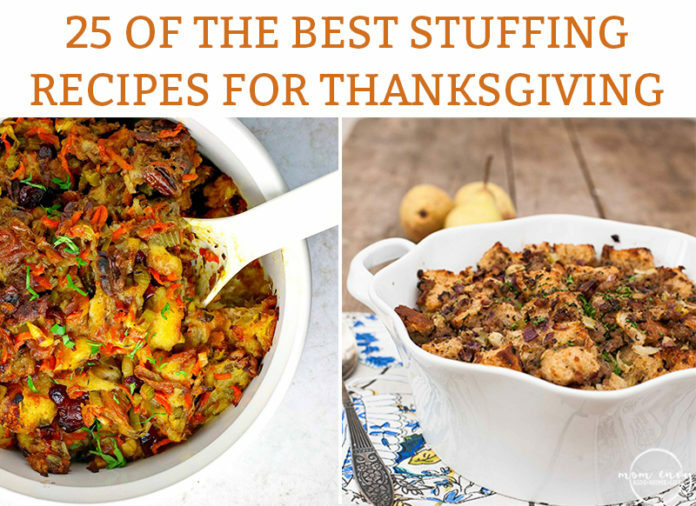 I had no idea there were so many different types of stuffing recipes out there. 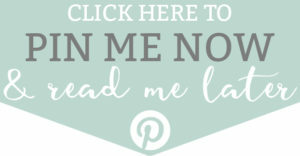 We’ve got everything you may need – classic recipes with traditional Thanksgiving flavors, unique flavors, corn bread, sausage, crock-pot recipes, gluten-free recipes, and vegan recipes. There is bound to be a recipe that is perfect for your family. 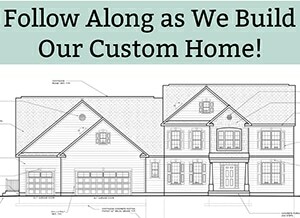 So find a new family favorite today! Looking for some more Thanksgiving recipes? 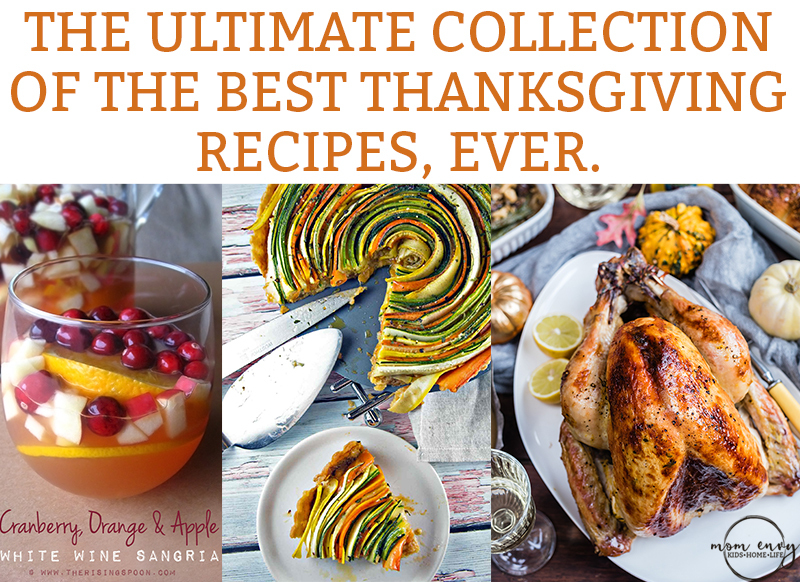 Check out the rest of the recipes from the Ultimate Thanksgiving Recipe Collection. 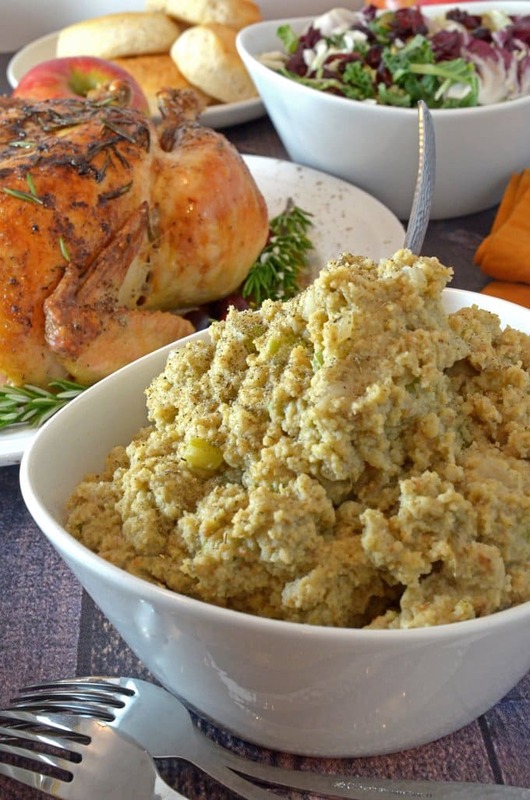 Easy Gluten Free Stuffing from Food Faith Fitness. Eating gluten free doesn’t mean living without your favorite Thanksgiving favorites. 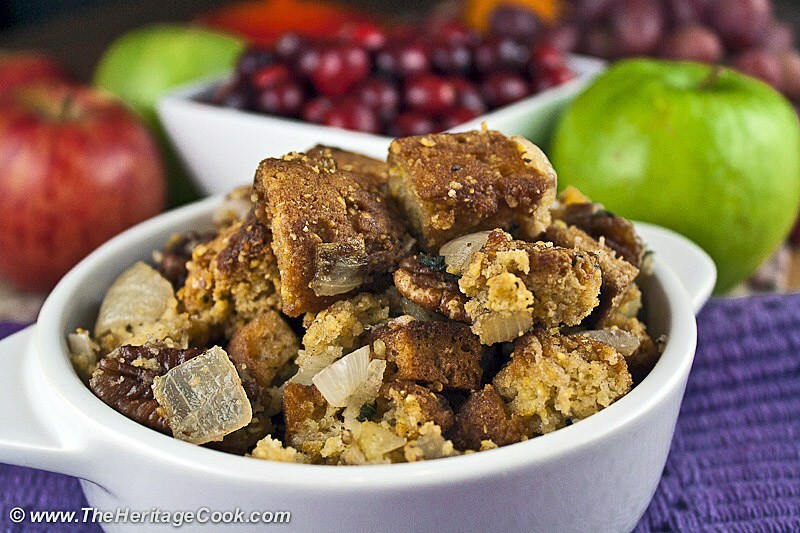 This gluten free stuffing recipe is easy and full of your favorite fall flavors. If you’ve read the descriptions above, you know that I have a thing for using crockpots for Thanksgiving meals. Serena’s stuffing recipe means once less dish fighting for oven space. 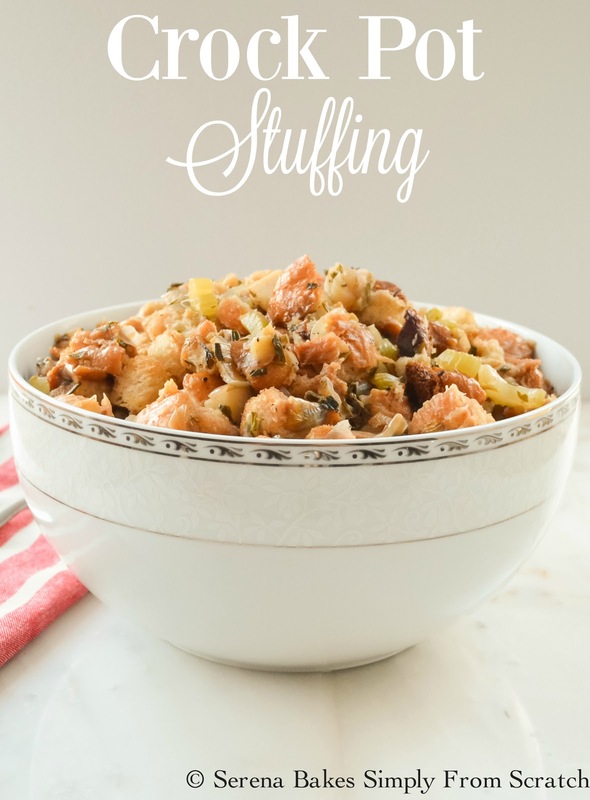 Check out her recipe for some special tips on how to make stuffing in a crockpot because it is a little different than traditional methods. 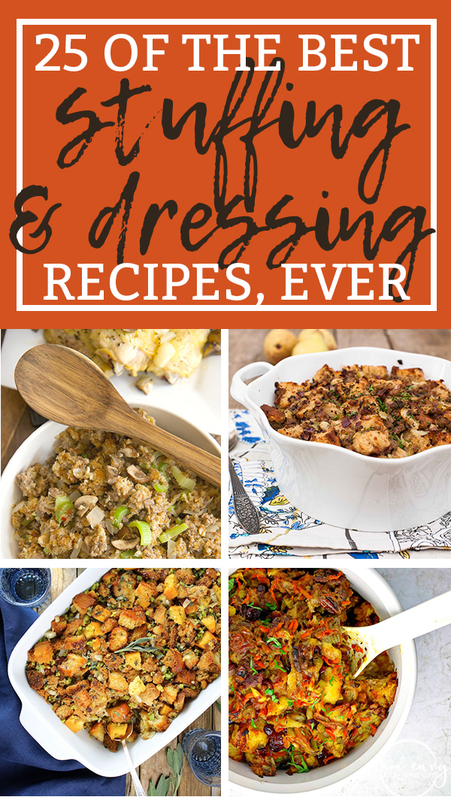 Looking for a completely unique dressing recipe this year? 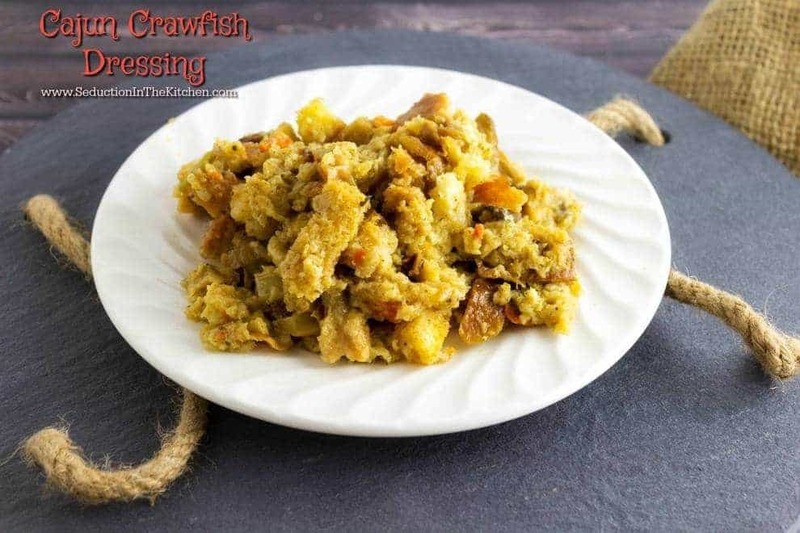 Try this Cajun crawfish dressing for a flavorful alternative to traditional Thanksgiving flavors. 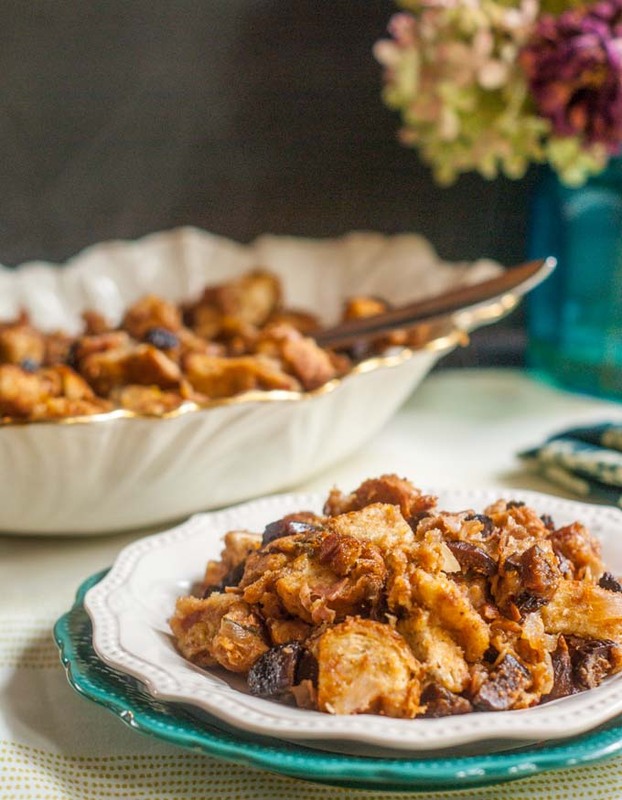 Audrey uses classic flavors in her gluten-free stuffing. It’s a simple recipe that is bound to make everyone at your Thanksgiving happy – not just those that need to eat a gluten-free diet. This stuffing is the perfect balance of salty and sweet with the addition of figs and pancetta. Do you have guests this year that eat a gluten-free diet? 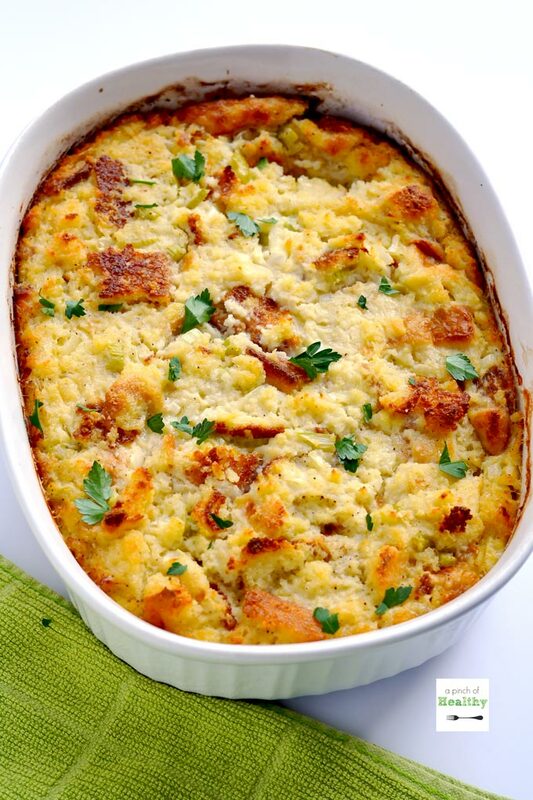 This cornbread stuffing will not disappoint. Jane adds in some additional flavorful ingredients like apples to make her stuffing extra special. Sausage stuffing is so delicious. We made it a few years ago and it was a huge hit. 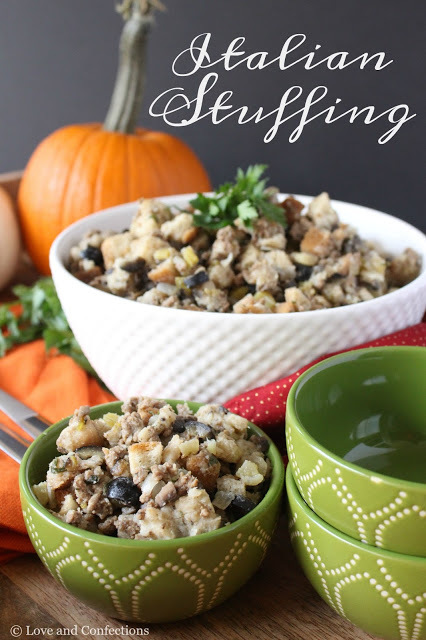 Kelly shares her stuffing inspired by her Dad. It has classic, comforting, down home flavors. I love that she uses breakfast sausage for her sausage choice. You’d never guess that Pamela uses instant potatoes to make her stuffing. The addition of the kale makes a great dish to try to sneak in some extra vegetables into your kids (or husband’s) dinner. Renee creates a herb-filled soup-like broth as the liquid in her stuffing. It adds so much flavor to her gluten free stuffing. You get the salt from the Italian sausage, the sweetness from the pear, and so much flavor from the sage. 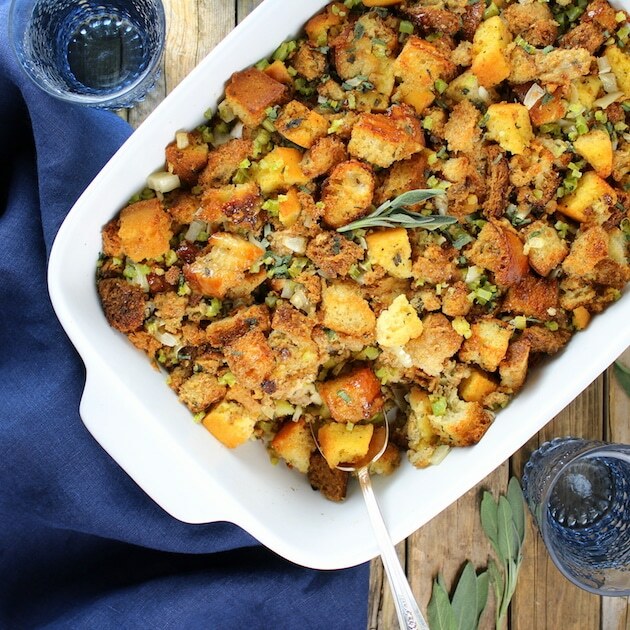 This stuffing is full of great fall flavors and will satisfy your guests. 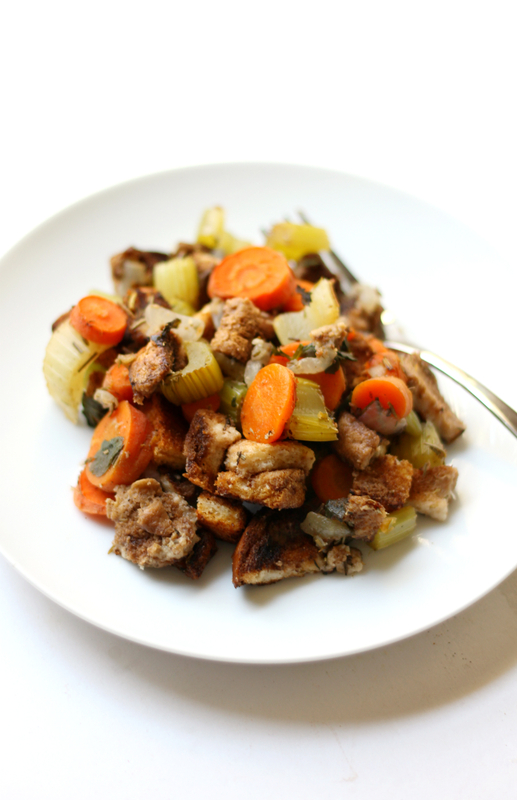 Pat and Dahn created such a flavorful, hearty stuffing. The lemon takes the stuffing up just a notch with the little bit of added acidity. 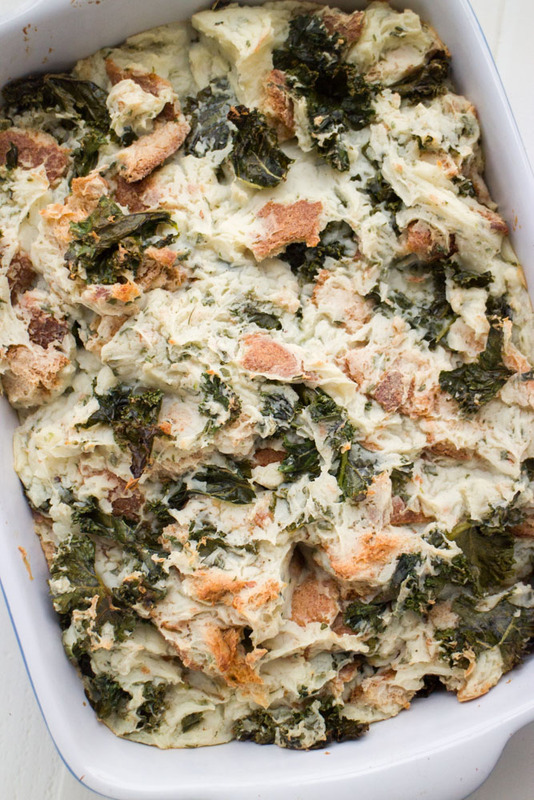 Even better is this stuffing can be made the night before which reduces some of the chaos the day of Thanksgiving. 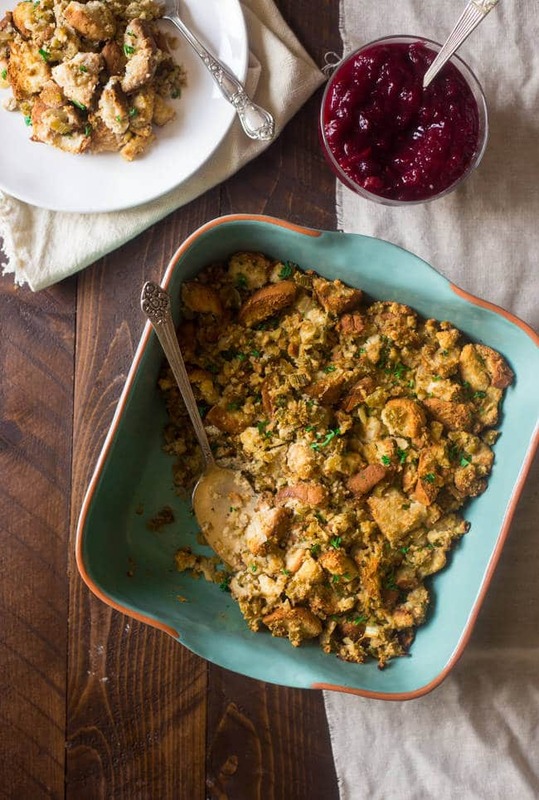 I’m not going to lie, this is a pretty perfect stuffing recipe. Not only is it made in a slow cooker (my favorite type of recipes), it also has bacon in it. Plus, it is filled with traditional herbs and spices. 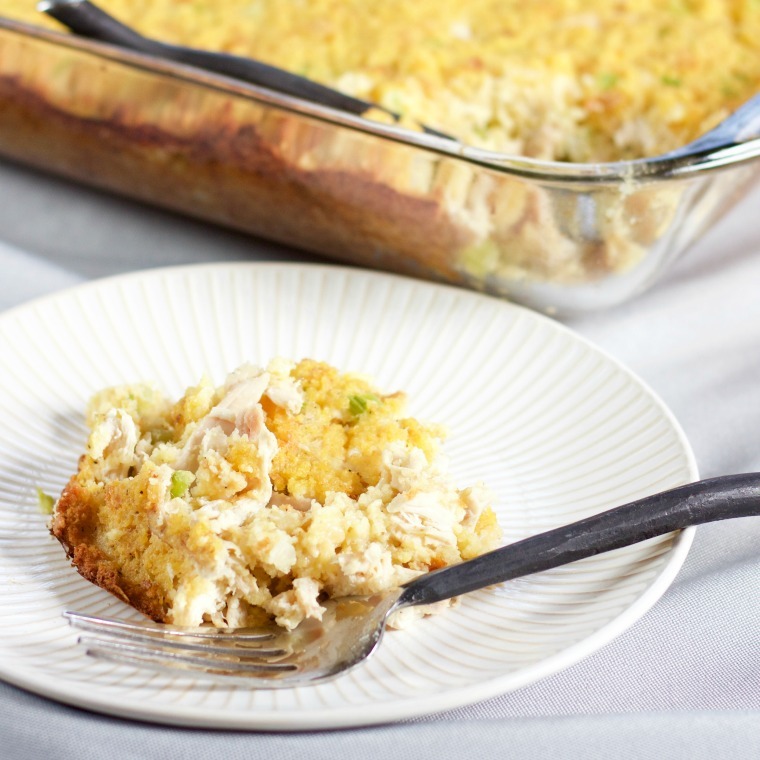 Marjorie shares her family’s southern cornbread dressing recipe that’s been passed down over the years. Like most family recipes, her Mom over the years has created it from memory and taste (aren’t those the best type of recipes). Her dressing recipe has traditional ingredients and is super simple to make. Do you have any vegan’s visiting this Thanksgiving? 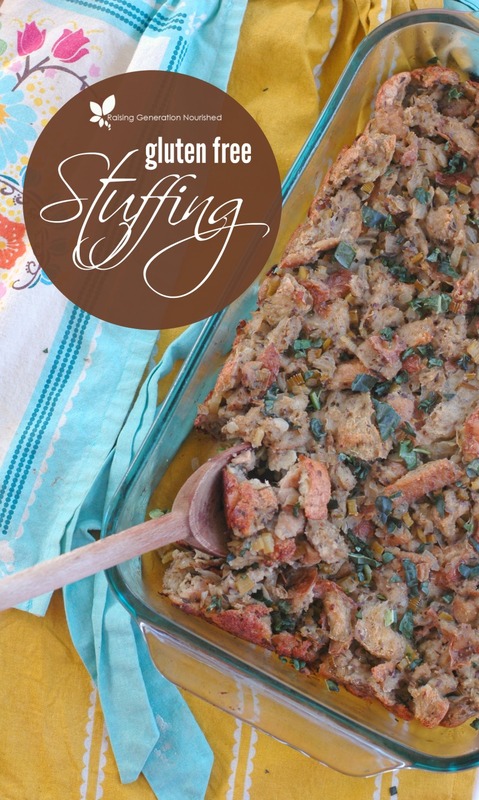 Then this stuffing recipe will fit your needs. 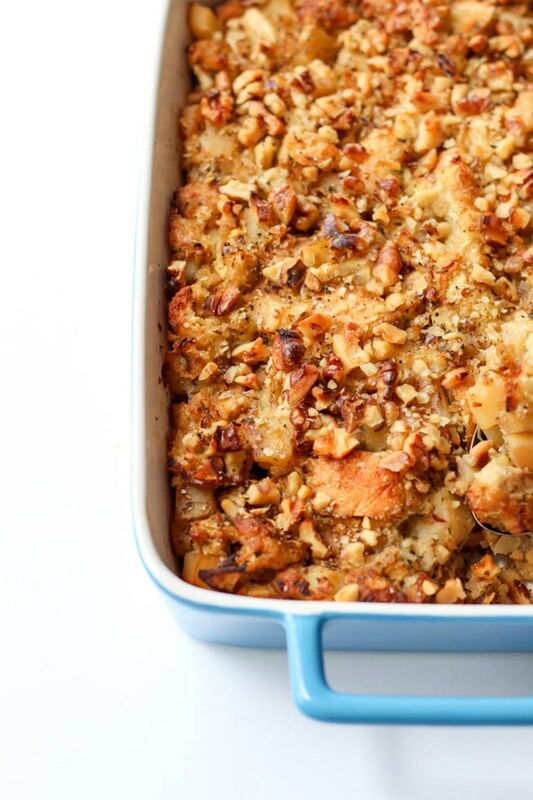 It features tempeh, parsnip, apple, sage and walnuts. 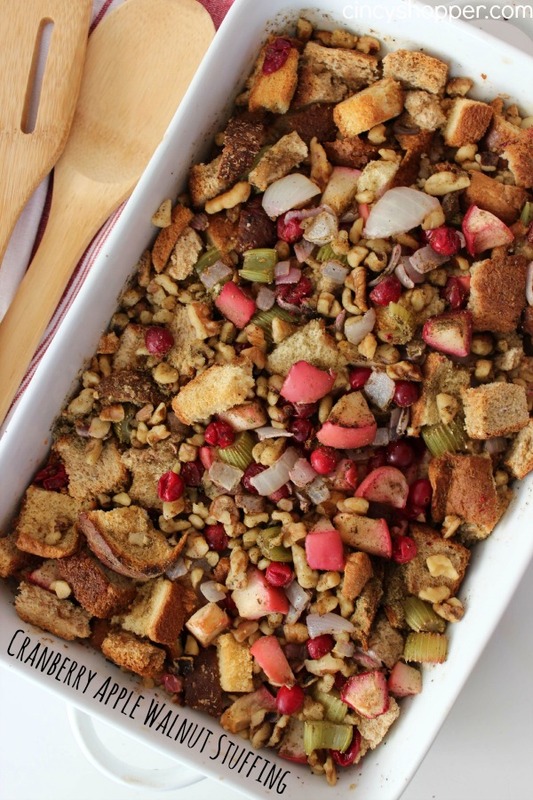 This stuffing is full of great ingredients. It has mushrooms, spicy sausage, and onion. It’s a simple recipe that’s easy to recreate thanks to the use of Pepperidge Farm’s herb stuffing. 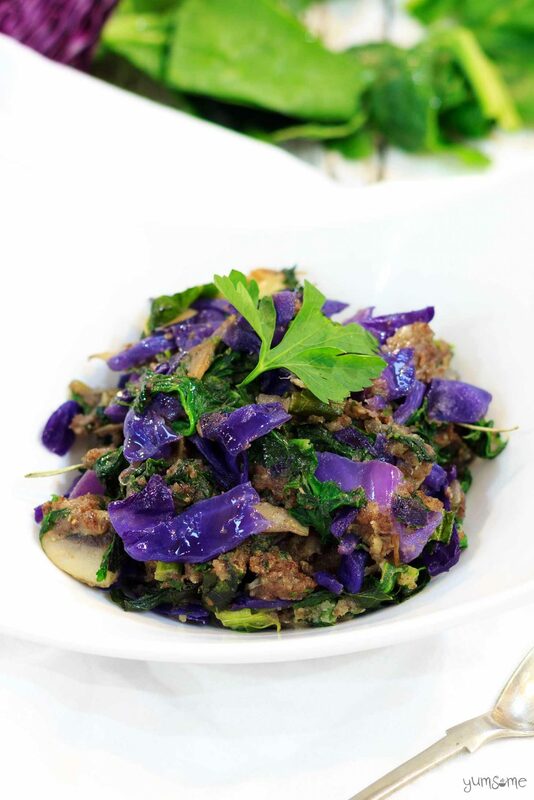 This vegan stuffing is so unique with the addition of red cabbage. It uses breadcrumbs in lieu of bread. 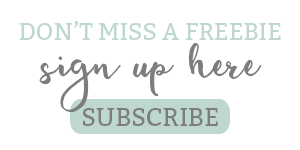 Killing Thyme has one of my favorite blog names, ever. It’s so clever. Anyway, back to her delicious stuffing. She uses King’s Hawaiian rolls which adds a hint of sweetness. I also love her addition of cranberries, carrots, leeks and pecans which all bring so much flavor to the dish. 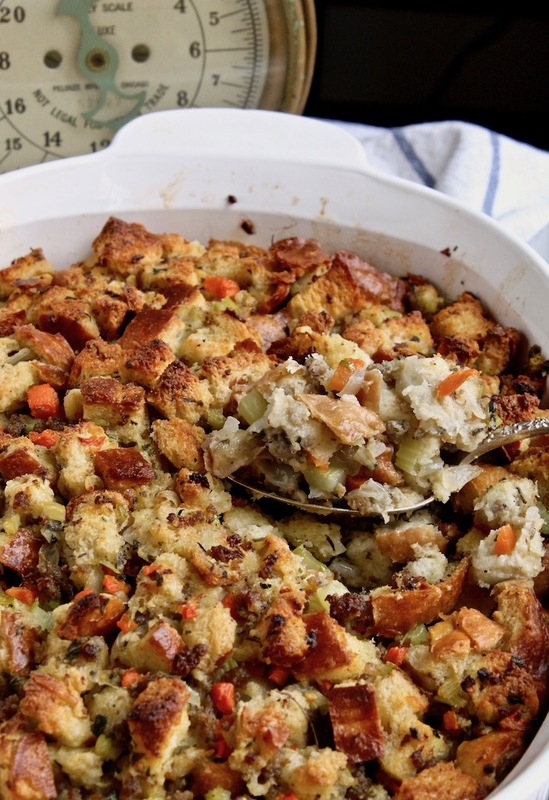 So this cornbread stuffing is different than others because it uses BISCUITS as the second bread. 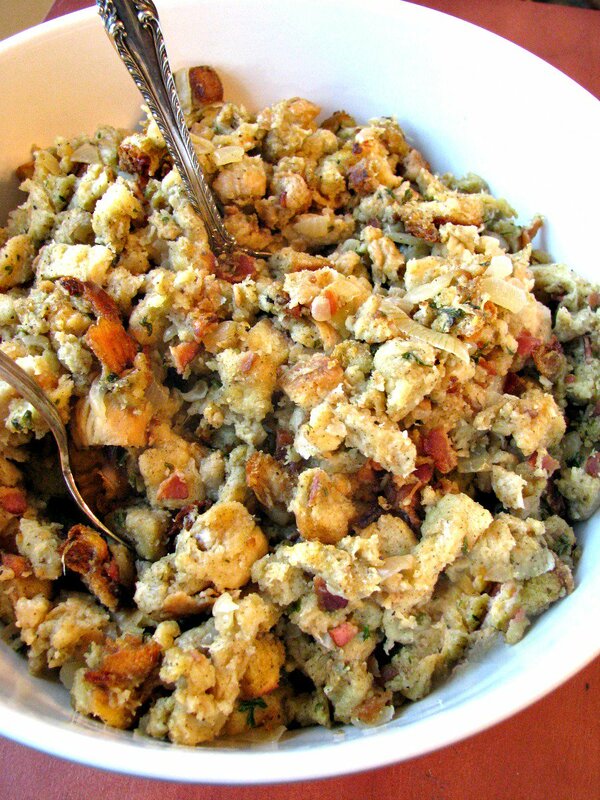 I LOVE biscuits and the idea of them in my stuffing is glorious. April Lee even shares a video of her making. 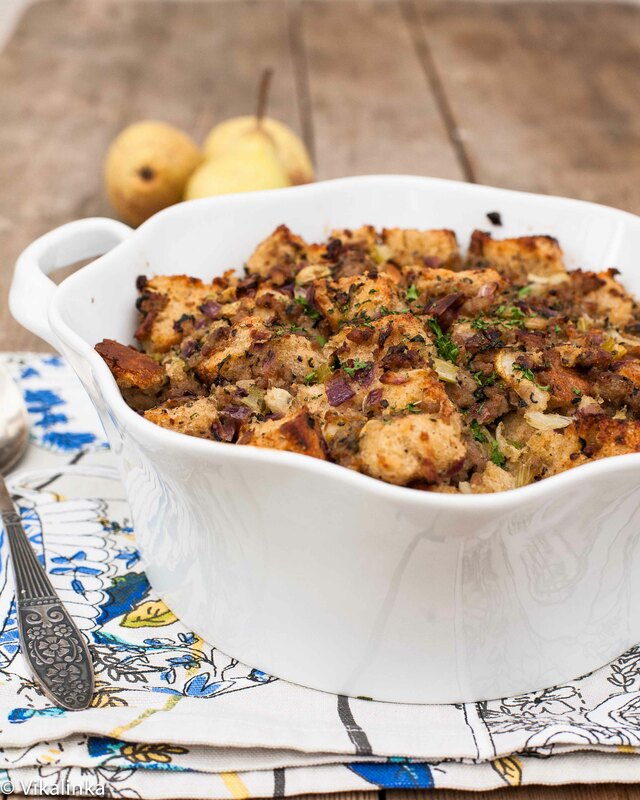 This rustic, hearty stuffing is started with a french baguette that’s been torn by hand. Karly then adds cranberries (the inspiration for her recipe), apples, walnuts, and lots of vibrant herbs. 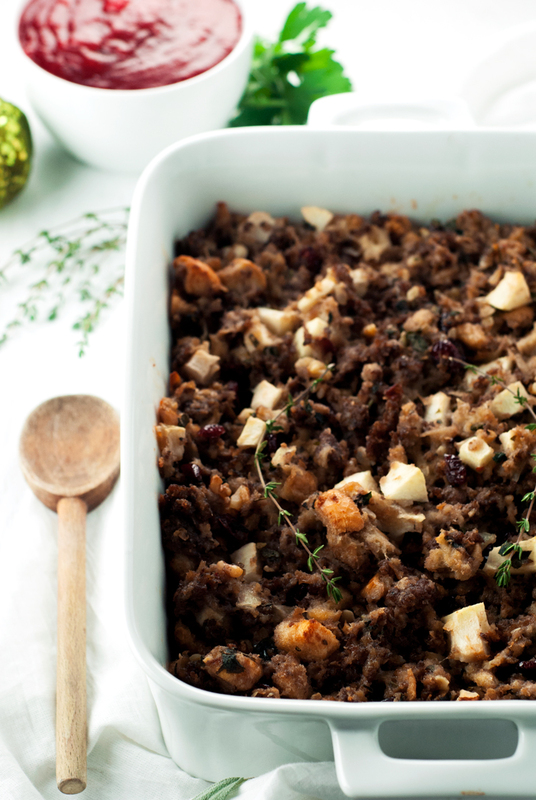 This semi-homemade stuffing is easier than it sounds. 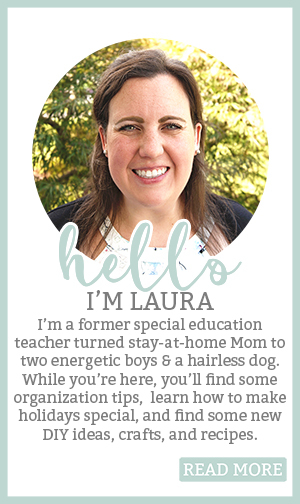 She has modified her great-grandmother’s recipe to make it more accessible. Hillary uses rotisserie chicken and cornbread mix as a short cut in this flavorful stuffing. 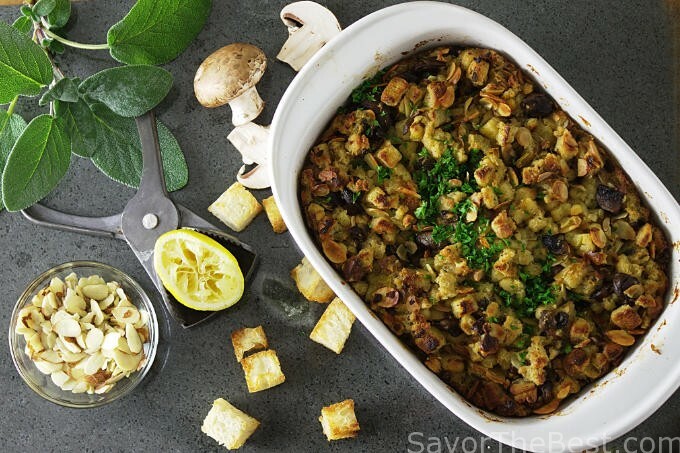 Taylor shares an easy gluten free stuffing that is full of traditional flavors. If you have gluten free guests, they’ll enjoy a classic Thanksgiving dish that still meets their dietary needs. 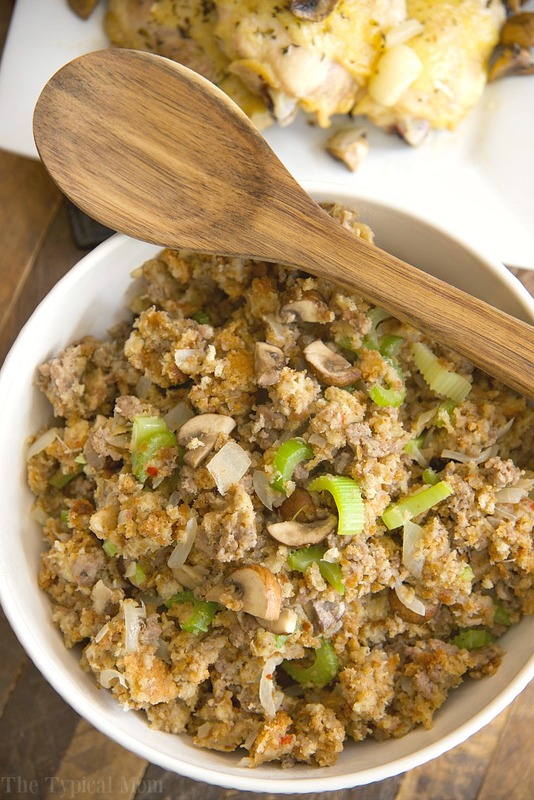 Terri’s stuffing has an unexpected ingredient that makes the dish – ground sirloin. It’s hearty enough it could almost be a meal on it’s own. 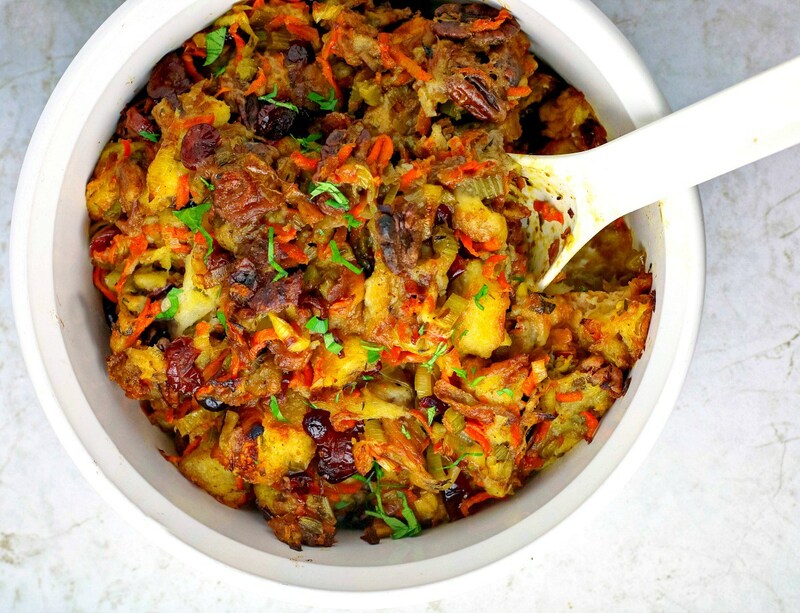 This colorful stuffing is sure to please your Thanksgiving crowd. It’s a super easy recipe to throw together, so you’ll love it, too. I love how Rebecca adds carrots and mushrooms to her stuffing. It makes it even heartier than your average stuffing. 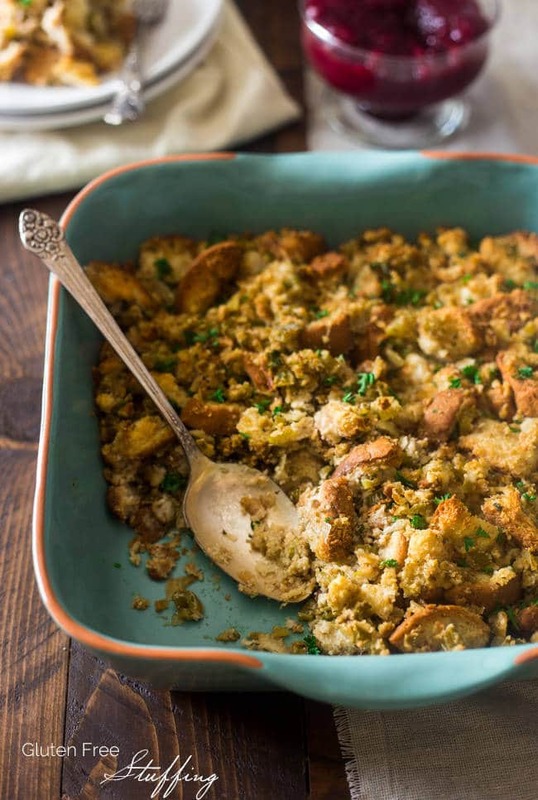 If you’ve never made stuffing before, Holly’s stuffing is a wonderful choice. 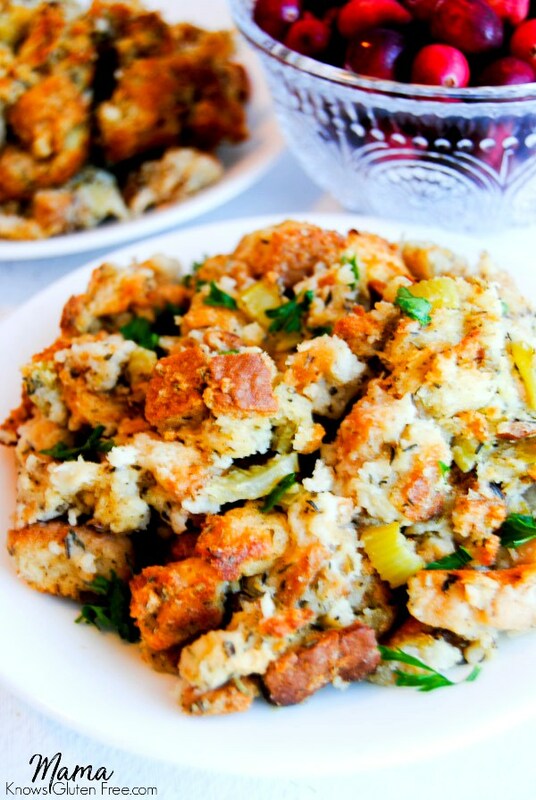 She shares step-by-step pictures of how to make this classic stuffing recipe. 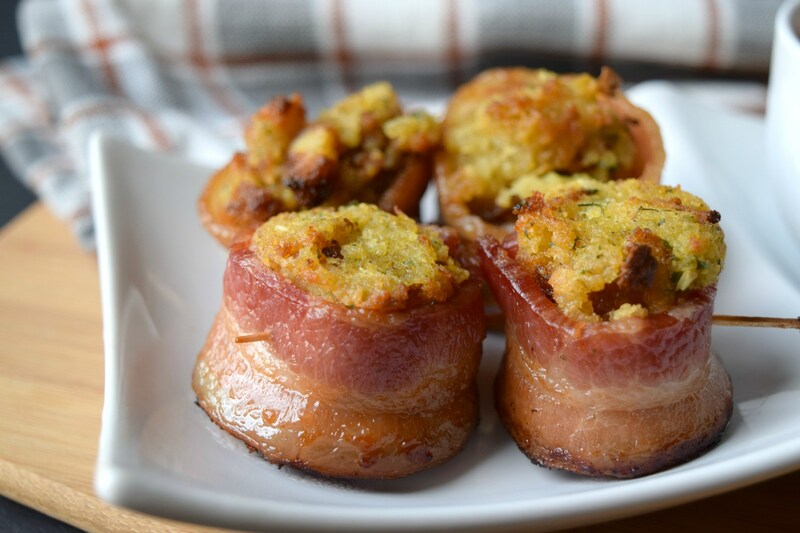 Bacon Wrapped Stuffing Bites from Who Needs a Cape? Alright, so I know this is not exactly a stuffing recipe. It’s more of an appetizer. 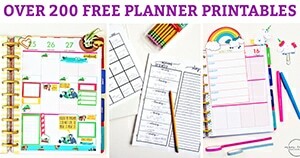 BUT I had to include these because if you have never tried them, you’re totally missing out. A good family friend of ours made these for a party once and my family was hooked.